Joyce Sasse - Annora Brown would be so proud to learn that Parks Canada honoured her by naming their Waterton Park Board Room after her – and suitably installing large, framed prints of six of her landscape paintings. Waterton Park had a major influence on her life. According to her autobiography Sketches from Life, it was here she found courage to work through hardship, see beauty and find hope. Annora faced many daunting times. She “graduated from Art School just in time for the Depression” (the Thirties). She was called back home to care for her ailing parents, thus ending her employment as an Art Instructor in Calgary. Life was difficult in conservative, couple-oriented Fort Macleod where she was isolated from any art-community. And she had no income except her father’s shrinking savings. The circumstances were “like a blinding sandstorm blackening my spirit”, she wrote. But after time spent “among the mountains that stood stalwart in the face of aeons”, she decided to move forward “with dignity” by drawing on her creative resiliency “to try every means possible” to provide the necessaries of life and nurture “the life of the spirit”. In her “time of healing … among the rarified air of the gods”, Annora’s spirit ripened. She realized she was where she belonged. She was invigorated by the wind. Sometimes she sensed in it the drama of a Wagnerian opera. Other times, it whispered the enticing notes of a Beethoven Symphony. In relating with the wildflowers, she wrote that she “felt a Presence, as though the spirits of the earth shared the moment” - that presence was God. She marveled at the richness of experience one has when surrounded by snow-capped peaks, glaciers, foothills and prairies. As one witnesses the dynamic forces that create the mood and character of the landscape, there comes a “healing” and ‘ripening” of one’s spirit. One becomes “fed to repletion”, she wrote. Ultimately the Calgary art community recognized her conservationist and artistic capabilities. 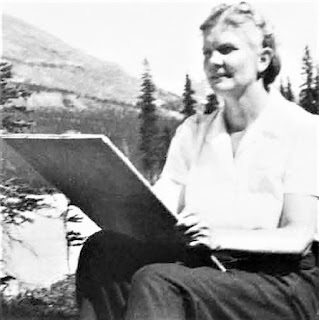 The Glenbow Museum commissioned her to paint 200 of the most rare wild flowers from her region – a herculean task. Within the 3-year time frame she completed an additional 300 flower images, which were sold to private persons. While she never stinted on the quality of her work, the demand drained her physically and emotionally. Her contract was completed, but the expectations of others were placed on her to repeat what she had been doing. She felt “labeled, tied, wrapped and boxed” in one style of art. “But I couldn’t stay the same forever!” In her mid 60’s, Annora wanted to continue experimenting with her creative impulses, trying new techniques, searching new vistas. By moving to BC, she found opportunity to venture forth with her artist-tools (line, form, rhythm, texture and colour). It was during this latter period, from her “folio of selected memories” she penned her autobiography Sketches from Life. There is a healing power that rejuvenates us when we are touched by the respect, reverence, wonder and gratitude that is implicit in this woman’s work. Thank you, Annora Brown.